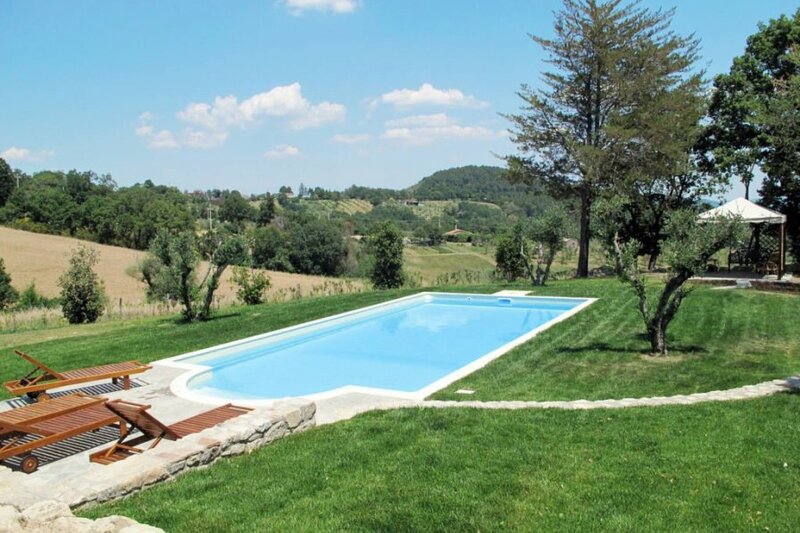 This 4 bedroom villa with private pool is located in Roccastrada and sleeps 10 people. It has WiFi. The villa is near a beach. Detached house, 8 - 10 people, 6 room/s, 4 bedroom/s, 3 bathroom/s, approximately 210 m², 2 floor/s. Furnishing: good, pleasing, with some antique furnishings, cotto floor. Equipment: satellite TV; internet access Wi-Fi (included); washing machine; pellet/wood chip heating. € 10 per person and stay (depending on occupancy). Pellets according to consumption approximately € 6/​bag. Firewood if required. Linen/towels available. Change of bed linen/​towels every 7 days included. Deposit € 300 (in cash). Cot € 25 per stay (on order). High chair 2x available, free of charge (on order). Pet not allowed. Access/parking: gravel road, approximately 250 m.
Estate (private use): approximately 6000 m² (whole estate 13 ha) , closed plot (fence, electric entrance gate), trees, natural surroundings. Pool (private use): 10.0 x 5.0 m, 20/04/19-05/10/19. Pool area: lawn for sunbathing, sun loungers, pavilion, external shower. Important information: Internet access (WiFi included, max 8 GB/week). Plot description: terrace (under trees), reserved open space, furnishing provided. The villa is described as good value for money. It has a private pool and is located in Roccastrada. The nearest airport is 130km away. It is set in a very convenient location, just 0 metres away from a beach and only 800 metres away from the city center.